Astro expanded its AI-powered bot to Slack on Tuesday, merging the communications channel with email. Astro is an email platform that uses artificial intelligence to triage email inboxes, helping users better manage their daily email deluge. Astro first launched in public beta earlier this year, alongside news that the Palo Alto-based company had raised $8 million in Series A financing. 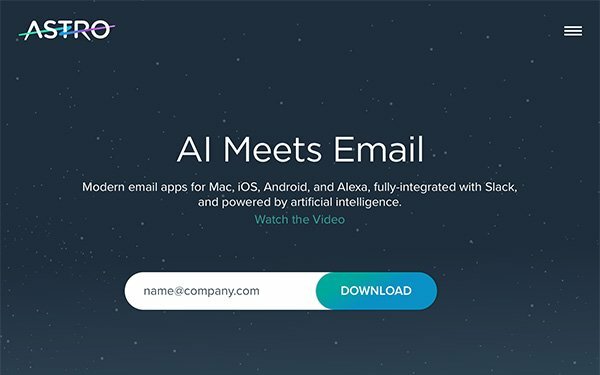 Astro’s AI technology powers a virtual email helper called Astrobot, a bot developed to help email users better organize and manage their inboxes. For example, Astrobot can highlight priority emails, remind users that they still need to respond to an email question, and ask users if they would like to unsubscribe from a newsletter that they never engage with. With the new Slack integration, Astrobot will also now allow users to read and respond to priority emails from directly within Slack. Customers who integrate Astrobot with Slack can choose to be alerted when important emails arrive in their inbox, such as from important clients or partners. Users can choose to reply, archive, delete or snooze their emails from directly within Slack. In addition to its Slack bot, Astro also unveiled an Alexa Skill integration that allows users to check their inbox and respond to important emails by voice. The Slack and Alexa bots are complimentary to users of Astro’s email platform.